Dried peas and lentils transform from inedible to delicious when cooked in water or stock and enriched with aromatic vegetables. 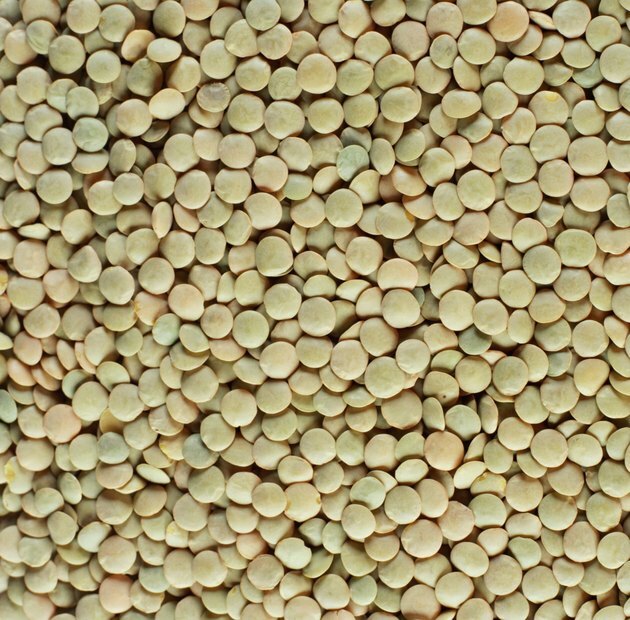 Split peas and lentils are the edible fruits of pulse crops. Pulses derive their name from the Latin puls, meaning thick soup. Split peas and lentils both provide hearty alternatives to meat-based meals, but each has a distinct taste, texture and cooking requirements. Peas, also named Pisum sativum, have husks that cover them, which although edible, dilute the fruit's earthy, rich flavor. Hulled and split peas cook faster, too, making them more convenient for busy cooks. Lentils vary in size, have a protective skin and can be red, gray yellow or black. Grocers carry either whole or split lentils, halved ones taking less time to cook, and each variety of lentil features subtly different texture and taste. Lentils and split peas each contain about 244 calories per cup. Split peas have 17 grams of protein, compared to lentils' 19 grams of protein. Both of these foods are high in fiber, which promotes good digestive health and cholesterol control. Peas have 6 grams of fiber, less than the almost 9 grams provided by lentils. If you are a vegetarian or vegan, lentils provide 7 milligrams of iron, while split peas only have 2.7 milligrams. Both foods are beneficial sources of potassium, with split peas providing 750 milligrams and lentils 772 milligrams per 1 cup. Packaged lentils and split peas are hard and dry, but they swell up and soften as they cook in water. To cook lentils for use in salads or other recipes, place lentils in a large pot and add fresh water. Check the packet for exact amounts needed. Bring the water to a boil, then simmer the lentils for about 30 minutes or until tender. Split peas turn creamier than whole lentils, and they cook in only 20 minutes. You can salt the lentils before or after cooking. Lentils have a rich, meaty taste that works well in cold salads or hot entrees. Classic lentil soup is a quick and uncomplicated dish, especially satisfying on cold winter days. Whole lentils keep their shape so they work well in salads and in stuffings for hollowed-out squash or large portabella mushrooms. Split peas, like halved lentils, disintegrate during cooking and form a paste-like consistency. Split pea soup, either with or without the addition of bacon or ham flavoring, has a slightly sweeter flavor than cooked split lentils, and yellow or green split peas maintain their cheery hue after cooking, as do red lentils. Alberta Pulse Growers: What are Pulses?